Success Principles: What Are The Four Success Principles That Builds A Life? 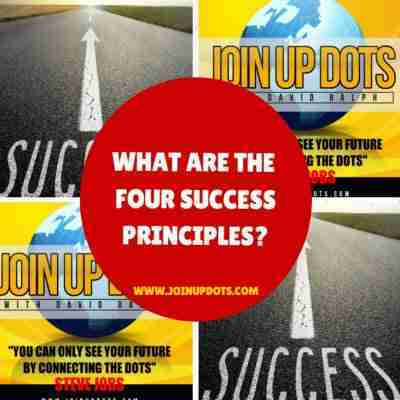 Welcome to the Steve Jobs based Join Up Dots Free Podcast looking at the Success Principles. Todays episode of Join Up Dots is a solo show, where your host David Ralph talk about what he considers the four key success principles in life. You see he has been through a hell of a journey and sometimes you need to stop and reflect on what is really important to you, and your business going forward. It’s not all grind you know, or at least it shouldnt be as who wants a life that is just work all the time? But that is most certainly what so many people have day to day. Deal with the kids, keep the wife happy, take out the rubbish, dal with clients, do their tax returns, break a sweat at every opportunity until its time to go to bed. Five hours or tossing and turning and then you are back at it. A hamster on a wheel, running, running and running until you burnout. And believe me, I see this time and time again, and have actually done the same thing twice before in my own life. There is no doubt in my mind that belief is the corner stone of what makes success. You have to believe that you will be able to achieve your dream, even though you dont know how you are going to do it. You have to have belief in something, and like Steve Jobs says in his famous Stanford Speech, it can be gut, intuition, karma whatever. But you have to believe in something. So surround yourself with images of people who are already doing what you want to do, and follow their blogs, email marketing whatever. Believe that you can do it, and do everything you can to surround yourself with stuff to explode that belief network. Success is great, and successes are what we all want. But a success after success life is never going to happen. And in a funny kind of way you dont want them to happen either. You see when it comes to the success principles it’s the failures that are the true winners. It’s the failures that build the old hustle muscle and makes your ultimate destination even better. So don’t sweat it when things go wrong. Don’t scream at the heavens “Why oh Why Oh Why! !” instead look at what went wrong and learn from it, so you dont make the same mistake again. And that my friends is the second of the Join Up Dots Success Principles…grow confidence because of your failures not your successes. Building a business is hard. Probably one of the hardest things you will ever do, and its your responsibility to look after your health as much as you do your email inbox. So take time off. Walk away from the business that you are creating and allow yourself to breath fresh air. Spend time with your kids, and your special person. Watch TV, in fact do anything other than work, as I promise you you will be better for it. A human is nothing more than a battery that needs recharging, and by re-charging you will work better. Deep down everyone is scared of starting something new as there is a chance that they will fail. So we put if off. We think that if we wait until tomorrow we will be in a better place to rock this thing to its core. But of course tomorrow never comes. As tomorrow becomes today and tomorrow is well….tomorrow. So the final Success principle is 100% start. It doesnt have to be perfect. It doesnt have to make sense. But start as soon as you can, as what you are aiming for is to build up momentum in your life until it does start to make sense. You are looking to build the belief that what you are doing is going to work, and that only occurs by starting. And that my friends is the four success principles as I see them in my own life, and I certainly think that you cant go far wrong by bringing them into your own.